Books Make a Difference wants to know all about our readers’ affairs. Ahem, namely the intimate connections forged with and through books. So this month we asked: Are you reading a book with someone this summer? What’s the book? Who’s reading it with you? 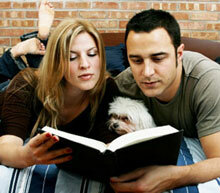 Is reading the same book with your best friend or spouse good for your relationship? What books have you read together in the past? How did you choose which book to read? What was your experience like? One of my family’s summer traditions is to visit the local library and get our three children registered for the summer reading program. The last couple years, my older two, a son who is going into eighth grade and a daughter who will be in sixth grade, have picked out titles to read with me. This summer, my daughter picked two titles in The Clique series, written by Lisi Harrison, and my son picked Vince Flynn’s American Assassin and Kill Shot. I cannot say these books would have been my pick, but I know the valuable connection when I learn about my children through the books they choose, and I always use the books for teachable moments. Our youngest, who will be going into second grade, is reading Charlotte’s Web with me. She and I are literally sharing the reading responsibility. It is an exciting transition in books for her and a step into a new phase in our mother/daughter relationship. There are other books I’m sharing, too. I’m reading the Paradox of Choice with a woman friend and mentor of mine, and three more books by authors I plan to interview for upcoming issues of Books Make a Difference. Books have been a continual bridge of conversation with my mother through the years. She usually has a stack of books she has finished, and she is hopeful I’ll take them and read them so we can talk about them later. I believe books are meant to be shared. Authors share their stories and their lives, and readers want to share the reading experience with friends and family so they are not the only ones changed by the process of reading a good book. What about you? Tell us about your shared reading experience.